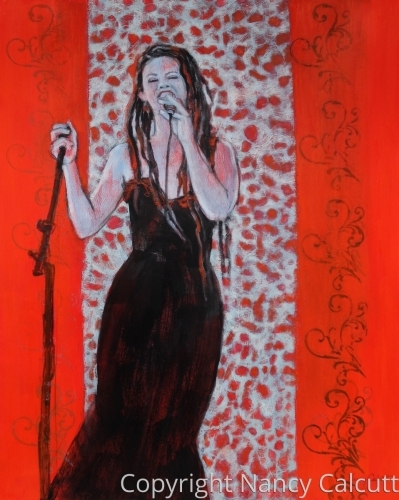 “Lady Sings the Blues in Black & Red”, a 19 5/8” x 15 3/4” x 3/4” figurative painting on cradled board, depicts a dark haired female singer in dramatic black dress, singing her heart out with microphone in hand. It is a mixed media painting done with acrylic & oil paint, ink, and lace paper. The painting comes wired and ready to hang, no frame needed, as it is 3/4 inches deep and painted black on the sides. The woman depicted in this piece is a Nashville singer/songwriter. She has amazing, long, dark haired, dreadlocks and a strong stage presence, lots of energy and intensity. The black dress reminds me of a fitted, mermaid-like dress that jazz singers used to wear. The red background with light blue lace paper as a backdrop for the singer complements the drama of the singer’s stage presence. Again, as the saying goes, “if you can’t paint it large, paint it red”. This is a medium sized painting with lots of visual impact. This painting started as a quick gesture drawing done with a black ink brush pen on top of the panel that I had toned with red paint. Gesture drawings are done to quickly capture movement and the general shapes and action of the figure or subject. Often the gesture drawings are full of energy and expressiveness and I always strive to keep those qualities intact in the finished piece. The lace paper collaged onto the painting creates an actual texture that is difficult to fully appreciate from a photo of the painting. The painting is finished with a couple of layers of wax varnish, which protects it from harm. The painting can also be buffed or cleaned with a soft white cloth.